It tickles me that Newton plucked a lyric from the goofy, loopy “MacArthur Park” to wish “Bob” well on his new gig. Maybe he’ll get a chance to do a duet with Richard Harris. A little reminder of where we live: we had a 5.6 magnitude earthquake this evening, centered about 40 miles or so south of us. I was sitting in my office with my laptop (where else? ), trying to do a simple project for Kate. First there was a rumble as the older, front portion of our house started to shake; then the back, which unlike the front is built on a slab, started to shake, too; and things kept rattling, the dog started barking, and I heard Kate, on the phone with Thom up in shake-free Eugene, exclaiming about the experience. In all, the episode lasted about 15 seconds. I think about earthquakes, for which we and most of our fellow citizens are probably woefully underprepared, pretty often. Several times I’ve awakened to a loud shaking in the house, so sometimes I wonder as I fall asleep whether I’ll be jolted awake in the night. In waking hours, they’re pretty far from my mind. But I always have the same thought as the realization dawns we’re having a quake: How bad will this be? Tonight: 15 seconds is plenty long to start wondering whether this is more than the hills up yonder having a little stretch. The biggest recent quake that most people outside the Bay Area have heard of, the Loma Prieta earthquake of October 17, 1989, lasted 17 seconds. The longest I’ve ever felt was one that woke me up just after noon one day in April 1984. The epicenter was a good 60 miles away, and the magnitude was a not-devastating-sounding 6.0 or so. But it lasted for about 40 seconds and unnervingly seemed to get stronger as it continued. For a nightmarish comparison, the earthquake that hit Mexico’s western coast in September 1985 and triggered building collapses in Mexico City (about 220 miles from the epicenter) is said to have lasted three minutes. That’s long enough to start believing the shaking will never stop, long enough to make you permanently lose your faith that the ground’s an essentially stable, solid thing. I have some good advice, if only you will accept it. sail in quest of news of your long-lost father. hard-pressed as you are, brave out one more year. and give your mother to another husband. –Leon Litwack, UC Berkeley history professor, upon retiring from teaching last spring (and for bonus points, the alumni magazine, California, carried a couple nice pieces on Litwack this fall: one on his career and final lecture, one from a former student). 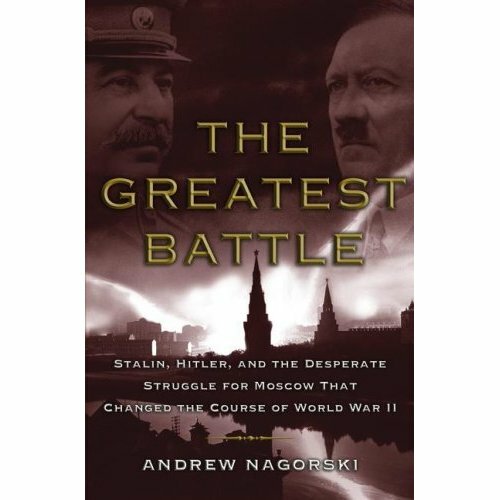 “The Greatest Battle.” A friend of ours once had a job that required him to travel to Moscow several times. He recalled a remarkable sight on the road into the city from the airport: a monument-sized tank trap, built to commemorate the Red Army’s last-ditch defense of the capital against Hitler’s army in World War II. The battle’s denouement is a martial epic, with the invaders on the city’s outskirts, below-zero temperatures, and a fierce counterattack by troops rushed thousands of miles from Siberia. I heard the author of the book on NPR today. He got access to Soviet sources, both documentary and human, that were off-limits to western historians until recently. Today’s ride: A “classic” loop route, from Yountville, just north of Napa, up the east side of the valley and across the hills at a low point, then up to a couple little valleys to the east, then back west over the hills at a much higher point, then a plunge back to the east side of the Napa Valley and back to Yountville. Cool-ish weather the last couple of days tricked me into wearing a long-sleeve jersey. It wasn’t needed. The weather was warm and sunny from beginning to end. The companions today: a writer and a carpenter in their later 50s and an electrical engineer who is 71. Yeah — 71. I was shocked, as he looked to be of an age with all of us 50-somethings. He was pretty strong and fast, too. Not to tempt the fates or furies, but f that’s what’s waiting for me in 18 years, I’ll be fine with it. A friend notes, by way of The Writer’s Almanac, that today is Dylan Thomas‘s birthday. If you’re not familiar with him, Thomas attracted wide notice at a very early age — he was barely 20 — and, thanks to radio, became something of a celebrity poet both in Britain and the United States. If for nothing else, you know him for the lines, “Do not go gentle into that good night/Rage, rage at the dying of the light.” But he was also a self-destructive alcoholic, and he drank himself to a very early grave. He wrote a poem marking his thirtieth birthday, and another marking his thirty-fifth; he was dead before his fortieth. Anyway, my friend pulled out a copy of “Quite Early One Morning,” a collection of short Thomas pieces. She read a funny number he wrote about reading poetry aloud. She said it made her angry that he was just allowed to drink himself to death. Which made me think how his story might have played out today, assuming a poet of his stripe might still be considered a person of public note. The picture that comes to mind is celebrity rehab; lots of relapses; lots of People and EW items on his case; maybe a feature or two cataloging the squalls between him and his wife, Caitlin (who wrote a memoir that has the aggrieved and enraged title, “Left-over Life to Kill”); you could even imagine the tabloid headlines: “Dylan: Blotto Again!” or “Caitlin Says, ‘I Hate You!’ ” But Dylan might live through all this, at least long enough to go on a fortieth or fiftieth birthday reading tour or to embarrass himself with an attempted hip-hop turn on the “People’s Choice Awards” (a New York Times reviewer asks, “What do people still see in this bloated, flabby lump?”; the Post is more concise, “Fat, Not Phat”). He might survive the “has-been rhymester” headlines long enough for the rehab to finally stick; and then, unsurprisingly given his religious Welsh upbringing, he’s born again and puts out a volume of Christian poetry (“Songs of Praise to Him Who Made Me”; example first line: “Go ahead, go gentle into that good night/Jesus is waiting with a shiny new night-light”); the reception among the literati is scornful; hard-core born-agains distrust his history of dissipation and foreign accent; but Dr. Phil sees an inspirational story, welcomes him into the fold for “getting real,” and “Songs” is launched onto the lower rungs of best-seller lists along with the latest Dan Brown and Suze Orman offerings. Then follows a popular autobiography, “Singing in My Chains,” a children’s book, “A Wale of a Poet,” and a concert tour with Sting and Bono. Alas, even in the company of such spiritually attuned and clean-living rockers, the lures of the road catch up to him. He disappears from his hotel suite after a sold-out Meadowlands show. The next day, a fan sells TMZ a video of Thomas downing shots at New York’s White Horse Tavern and boozily denouncing “that wanker Dr. Phil”; the poet is arrested for public indecency after urinating in the doorway of a Manhattan fire station; from a Riker’s Island jail cell he apologizes to his fans and Dr. Phil. He goes back into rehab. And, after a tearful confession of error on Oprah, gets a new book deal. Back from Chicago last night. This afternoon, I walked up to campus — here, that automatically means UC Berkeley — for an appointment with an undergraduate advisor in the College of Letters and Science. Mission: to see what I need to do to finish my bachelor’s degree. Yes, we have no B.A. I went to school back between 1974 and 1980, but never finished. That never seemed to affect my life or work prospects because I was lucky enough to get real experience right out of high school in a field, daily journalism, that hardly asked what college you went to or what you did there as long as you had the fire and the talent for the work. And for a long time, that was enough. When I left daily print journalism in the mid-90s, my resume was my degree, and for a while, that was enough. But at this point — having bounced around online journalism, TV news, magazine editing and writing, and some marketing stuff, among other things; and having watched that daily print news world I came from wither — I’m thinking of other things I might do (I’m told I’d make a great history teacher if I can avoid scuffling with the students), and that resume is no longer enough. And beside all that, I admit it’s always bothered me a little to have that uncompleted task out there. Sitting in Terminal 3, Concourse L, waiting for my American Airlines flight back to San Francisco. Mission accomplished, mostly. My dad’s out of his rehab hospital, safely ensconced back in his North Side apartment (thanks to the heroic efforts of my sister Ann and brother-in-law Dan). Wish I was staying longer or lived much closer so that my visits didn’t require absenting myself from the rest of my life. And I wish I could have gotten out of town without starting a family fight, taking my dad’s keys with me, and forgetting my camera. So, just about to board the plane. Flying in the economy cabin, which is really the “you’ll take whatever we dish out” Greyhound section of the plane. Fine. I did manage a moment of first-class treatment coming and going. Flying out of San Francisco, I was very late getting to the airport. The person who checked in my baggage directed me to get in the nearest line through the security checkpoint. She actually said “hurry!” Densely, all I noted when I first got in line was that it was a lot shorter than the other one I could see. “Why don’t some of those people come over here?” I wondered. Then I saw a big sign that I had missed: VIP/First Class Security Check, or something like that. I thought for a millisecond, just out of a sense of heeding the ordained order of things, about getting out of the line and going to the one for serfs, helots and general unfortunates. But I stayed put. I figured I’d tell the TSA officer checking boarding passes and IDs that I’d been told to hustle my way to the gate and that I needed to be in this line. So fast-forward to this afternoon. I was in a long security line in the American terminal, and for some reason one of the carrier’s line minders asked to see my boarding pass. I showed it to her, and she said, “Sir, please go down there and go through that line.” “Why?” I asked, with more than a trace of suspicion, bordering on resistance. “It’s closer to your gate,” she said. So I went down the terminal a ways and stood in the next line, which was much, much shorter. “Thanks, line minder,” I thought to myself. Then a woman behind me began complaining about O’Hare and all the long lines and about what a nightmare it would be if she had been traveling “without status.” It was then I noticed the sign that said I was standing in the line reserved for elite passengers. No wonder it was short. But glancing around, I realized the TSA people inspecting documents weren’t looking to see whether any non-million-mile flyers were trying to sneak through. So I stayed in the line and avoided a good 30- or 45-minute wait with the serfs, helots, etc. I tried to visit the wholesome hipster dive in Evanston this evening to get my daily requirement of ebbing and flowing data. I was encouraged when I walked up to the front door, because it didn’t look like the front of the place was crowded. As I opened up the outside door, though, I realized that some guy was doing a standup routine — a monologue or poetry or something. It looked like most of the seats in the place were taken, though it did not appear the clientele was taken with or particularly attentive to the narrative issuing from the stage. I didn’t go in. Instead, I went back to the car and turned on the computer to see whether I could get curbside WiFi. Yes: the wholesome upscale grocery store at this corner has free wireless, and lots of it. Instead of launching into subjects that sorely need launching into, such as our continuing inability as a nation of drivers and pedestrians and such like to all just get along, let me instead offer a front-seat observation relevant to this very block. I discovered the hipster WiFi place I mentioned is right across from the Evanston Peet’s coffee shop. I found this Peet’s soon after it opened; a junky just knows where to find a fix. Sometimes I bring my laptop to Peet’s, which has no wireless network; several networks are active in the neighborhood, though, and the one I usually get on is from the hipster place. Eventually I went into the hipster place to sit and drink coffee as a way of paying for the free ride. I’ve brought Dad up here three or four times, too. We’d buy coffee and pastries and sit on the bar stools at the high granite-topped counter that runs along the picture window facing out onto the street. Across the way, and just to the right, or to the south if you’re using a compass, there’s a nice-looking retirement residence. On one Peet’s visit, Dad looked across at the place and said, “The doctor who set my broken arm used to live over there.” The broken arm happened in the early ’30s, but Dad still recalls how, after he had jumped off an ice wagon and fallen one Saturday, Dr. Nels Melling was summoned to the Brekke home out on Nashville Avenue. I take it that he assessed my dad’s arm without benefit of X-rays and set it right on the spot. On the kitchen table, in fact (he directed my grandmother to take “the boy” to the hospital for an X-ray on the following Monday; the arm didn’t need any further intervention). But that wasn’t Dr. Melling’s only service to the clan. He was the regular family doctor, a major point in his favor being that he was, like the Brekkes and Sieversons (my grandmother’s family), Norwegian. So he treated my dad’s dad for the effects of Parkinson’s — the disease that killed him in 1932 at age 55. And he treated my dad’s aunt, Esther Sieverson, when she was stricken by breast cancer (I gather that back then, the only treatment was radical mastectomy and hope for the best); she died in 1938, just 48 years old. Before he treated any of these, he had been the doctor for the previous generation of Sieversons. (My dad says that the story the family told about Melling is that he become quite wealthy by the late 1920s; he even had a driver and car to take him to house calls. But he lost most of his money in the 1929 stock market crash and took to driving himself to see his patients). I’m sure Dr. Melling saw the family for all sorts of large and small maladies — the Sieversons, in particular, were not a robust bunch; I think only one of my grandmother’s 10 siblings made it out of her 50s. But think about those three cases, and think about medicine today. For a broken arm, a Parkinson’s case, and breast cancer, you’d have an army of people involved, and it’s really inconceivable that an internist, no matter how skillful, would have an intimate involvement in treating all three (let’s not even mention the notion of weekend house calls). Which isn’t to say anything about quality of care; the odds of survival for the diseases that took so many in my dad’s family so young are miraculously improved over what they were in the 1930s. It’s just that this change from one medical world to another — at least in this very wealthy place — has taken place in the span of one lifetime. At home, I have DSL and WiFi, though I’m not going to insist that the always-on access is a good thing. There’s more than a little bit of distraction — if not obsession or addiction — to being connected all the time whether or not I need to be. In Chicago, access is more of a challenge. I actually have to go looking for a place to get online; it’s not hard to find a place — plenty of cafes have free WiFi, and you can always go to Starbuck’s and pay for T-mobile service. But sometimes — say late on a Saturday night — you don’t necessarily care to go traipsing up to the wholesome hipster dive you’ve discovered in Evanston to buy a mocha to secure the privilege of jumping onto the network. So then what do you do? I tried to dial up my dad’s ISP last night, but failed because I didn’t have a working access number. None of the neighbors wireless LANs were open — people have started to figure out that they can password-protect their networks. It was too late to go schlepping out, so I just turned off the computer and read for a while (oh, sure: the birth of a healthy trend). Tonight, not having been online for … nearly 48 hours … I decided to go up to the hipster place. But I wasn’t really anxious to go. So I turned on my laptop and checked for an open network before I turned the ignition. Ah — I found one. Email: check. Posting last night’s blog post: check. Writing this little slice o’ life and sweating because this laptop is hot: check. Now I’m going to post this, too, then pack up the computer, get out of the car, and enjoy the breeze — another good southwesterly — that’s been building all day. ‘Night, everyone. Procedure: Mix Peet’s with dairy whitener (optional). Gently fold in other ingredients gently, then whip into light peaks. Bake, broil, steam, poach and/or to taste, taking care not to overcook. Set aside to cool.